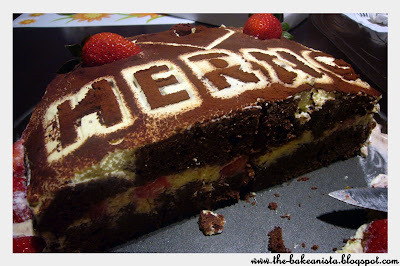 "What's your favourite cake, Herng? Do you want to try an orange flavoured one?" I asked. "Har?" he gasped and said, "I don't want an orange cake! I don't like orange. My favourite fruit is strawberries. Can I have strawberries instead?" Then he thought for a tad while with his pointy finger on his chin then continued, "I like Chocolate Cake! But not the one from the toilet lah," my couzie said with a smirk. I looked up recipe after recipe to combine both chocolate and strawberry into one cake. And finally I came up with a decision. I'll bake a chocolate cake and have a layer of cream with strawberries in the middle. But the problem is, I've not baked any layered cake before in my entire baking history. "Everything has its first time, sweetie," my mum said encouragingly. 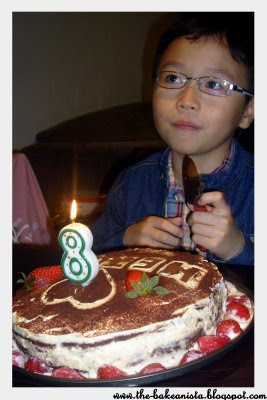 The name of the cake was dubbed by my brother. Well, it was because the cake looked hideously volcanic before the decorations was up. And my smartie-pants brudder said that the creamy strawberry circling the cake makes it look like an island. 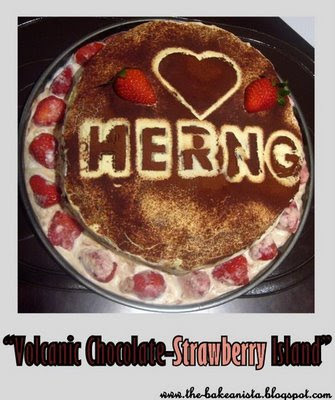 That was pretty much how he creatively came about naming the cake as such: Volcanic Chocolate-Strawberry Island.